The Green Party is supporting a campaign to get councils to pass a motion of support for the Robin Hood Tax. 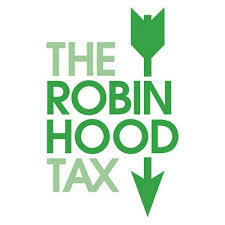 The Robin Hood Tax – or Financial Transaction Tax (FTT) is a tiny tax of about 0.05% on transactions made by banks, hedge funds and the financial sector. The tax could raise £250 billion a year globally, with some of the money being used to support council services that have been decimated by government cuts. Another advantage of an FTT is that it helps reduce the number of risky financial transactions, the gambling which helped to trigger the financial crisis. The Green Party is urging people to take an easy action by writing to their local councillors asking them to pass a motion supporting the FTT, almost 40 councils have already passed such a motion. Professor Molly Scott Cato, who is the Green Party’s finance spokesperson and a leading European candidate said: “The Green group in the European Parliament has been instrumental in pushing for a FTT. Eleven Member States including Germany, France, Italy and Spain have decided to put people before the profits of their big banks and financial speculators and Introduce a Financial Transaction Tax. This entry was posted in Campaigns and tagged banks, Financial Transaction Tax, FTT, Green Party’s finance spokesperson, hedge funds, hedge funds and the financial sector, Professor Molly Scott Cato, the financial sector, the Green Party, The Robin Hood Tax by tamesidegreens. Bookmark the permalink.